Reading Theresa Whistler's sympathetic and beautifully written biography of Walter de la Mare, I was reminded of the fickleness of literary reputation. Walter de la Mare's is ripe for reassessment. After a perilously slow start, it was only 'political intervention' and a civil list grant that rescued him from servitude at the offices of Standard Oil (working in the statistics department) to become a major literary figure (and able to make his living at it), only now to have his star obscured: surviving in his much anthologised poetry for children and the periodic reprints of novels, stories and poems for the dedicated camp followers (of which I am one). Collectively we consume one and half times what the world can re-generate in any one year (and this is trending relentlessly upwards). To listen to most mainstream commentators, this simple, unarguable fact has no purchase either on their imaginations or their thinking. If we think about it at all, it is to assume that 'something' (anything) will come along to 'fix' this problem and we carry on carrying on. Jung wrote that what we do not acknowledge tends to come back, through the back door, as diseases, and, so it does. In our case, we might only contemplate the burgeoning incidence of depression as our lives become more disjointed from a sense of agency, one that coheres and directs within supportive communal frames, patterns of shared meaning and a living environment. We might, also, note that our prophets of imagined futures have moved from nineteenth century utopia to twentieth/twenty first century dystopia. A breath to forms which can outlive all flesh". The 'Artist...' is the subtitle of Dana Greene's concise, illuminating and moving biography of Evelyn Underhill. 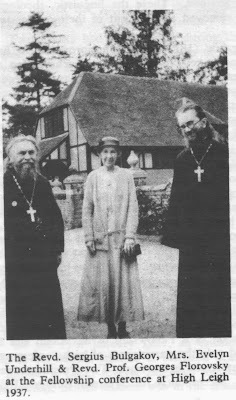 Underhill was one of a number of key figures at the end of the nineteenth century and beginning of the twentieth who restored an understanding of 'mysticism' to the Christian West and to the wider culture. The self taught (if generously supported) Underhill was at the popular end of this trajectory (and accordingly has been earnestly criticised by later scholarship). The irony being that many of her books remain in print, eagerly read, for their insight and passion and will be so long after the snappy (if partially justified) academics have long since been forgotten! It is the end of the eighteenth century and revolution has come to France and Napoleon is rising. In Lublin in Poland, the Seer of Lublin, a Hasidic rabbi, is coming to believe that Napoleon is the prophesied one who will bring to bear the final war of 'Gog and Magog' and the coming of the Messiah. If this is so, is it permitted to use Cabalistic magic to bring Napoleon on? Can we not only pray for victory but seek to manipulate the heavens to bring it about? The answer of the Seer is yes. Power in the hands of just men can be used wisely, even if that wise use means much current suffering, for the end, the Lord's coming, will justify those means. The composer, Sir John Tavener, has died at 69. I remember him addressing the first Temenos Conference at Dartington Hall in 1986. Every inch the composer of a sacred music, a music that he felt as his vocation to write. The conference featured a concert of his music including this 'The Lamb', his setting of the poem by Blake, the first piece of his music that I ever listened to, matching the text's illuminating simplicity with a luminosity of its own. This is a photograph I took yesterday, rounding the headland onto Slapton Sands. We were taking a shortcut back, now that the tide had retreated, aching legs not fancying the upward, downward climb we had taken outwards, earlier over the cliffs. 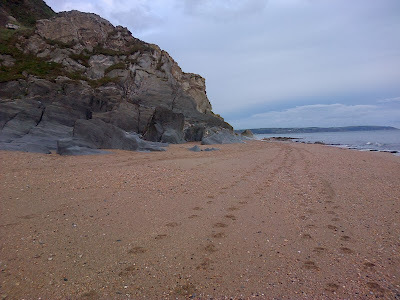 Slapton, shown below, was infamously where a trial landing for D-Day in 1944 went disastrously wrong and almost a thousand American soldiers were killed as a result both of German attack and ill co-ordinated 'friendly fire'! It is a history that on Remembrance weekend was close to memory yet distant from the actuality of present place: a serene beach held on a perfect early November day, sea stilled in peacefulness. The gap between the unfolding 'suchness' of the world and our willingness to bend it out of shape, to do it violence, was vividly present. I walk under rolling grey clouds, with ending rain and wild winds. Leaves traced across the air to ground, the water in the fountain wobbled uncertainly and dusk gathered in the silence of the garden. I am at Schumacher College at a four day course on non-violence and spiritual activism and was taking a late afternoon break to visit the gardens at Dartington Hall. 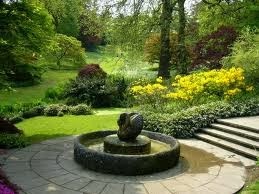 These gardens carry great meaning for me and, as I walked, I remembered they had carried a beautiful lesson in peace. 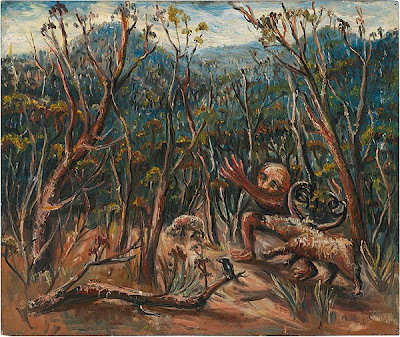 'The Australians' (a two hundred survey of Australian art linked by the theme of landscape at the Royal Academy) held two traditions in parallel. The indigenous tradition of Aborigine art, with which the exhibition opened, has continued to develop its own unique and powerful styles and, periodically, you noticed it having an effect, leaving traces in the contemporaneous tradition of 'Western' art. At the outset of 'Western art' in Australia, artists confronted by a radically new land, confined themselves to painting their new settlements and their immediate surroundings but they soon branched out in Romantic, Impressionist and Modernist directions, making an art that was both indebted to European forms and yet held something other, conditioned by a new landscape and especially new attributes of light and space.